Thanks to Pressman Toys/Goliath Games for providing these games to you all. Also, providing me with many games you’ll see on my social channels and here sometimes. Post below may contain Amazon affiliate links, if you order through the provided links, I may receive a kickback at no extra charge to you. Hopefully, you’ve been around my blog for quite some time. But if you are new here, I am a board/card game lover and collecter. The topic of games will come up a lot around here and today will be no different. Today I am going to give you 4 travel games that you are going to want to pack along with you for all those spring & summer travel plans. Plus, lucky you, you are going to get the chance to win all 4 of these games thanks to Pressman Toys/Goliath Games at the end of this post. 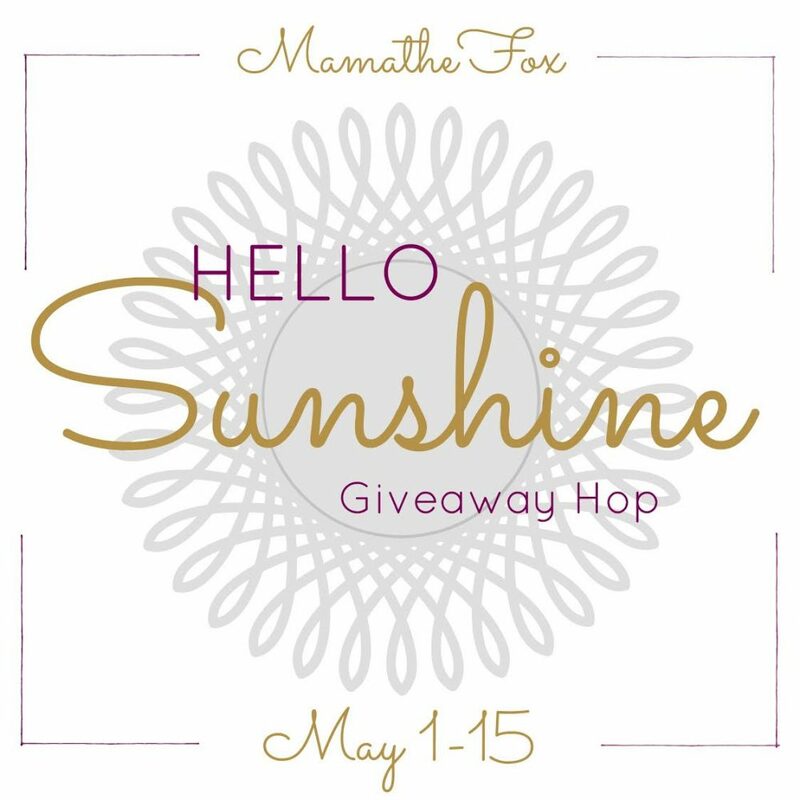 Thanks to MamatheFox for a great giveaway hop to be a part of for these 4 travel games. At the end of the post, you’ll also see all the others that are taking part of this giveaway hop and have more chances to win some great prizes. 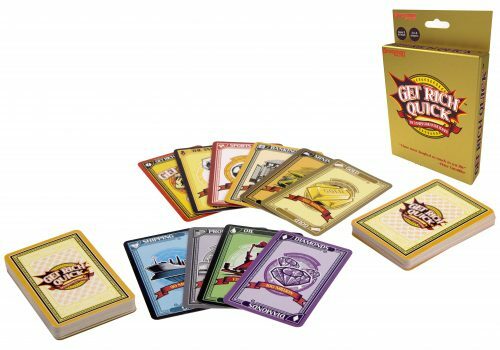 Get Rich Quick (for 3 to 8 players, ages 8 to adult) – The game where the faster you trade, the faster you win! It’s fun! It’s frantic – and there are lots of twists – it’s a game that makes you seriously rich! Easy to learn, fun to play, and you can GET RICH QUICK! 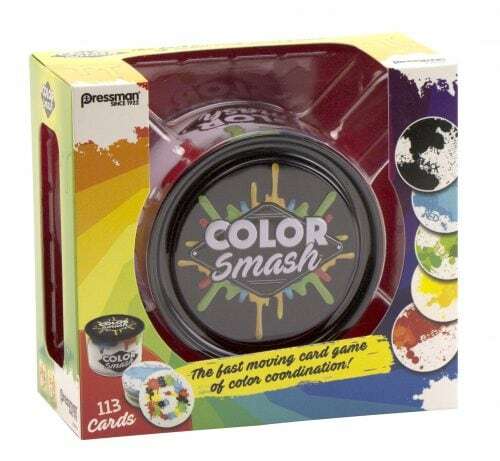 Color Smash (for 2 to 6 players, ages 5 to adult) – Color Smash is the fun, fast card game of color coordination and fast reflexes! Players take turns laying their splats on the stack until there is a splat with the word on it then SLAP! Be the player to collect the most cards to win! 6-in-1 Magnetic Games (for 2 to 4 players, ages 7 to adult) – Turn the knobs to scroll through six different games in one convenient package! Absolutely perfect for traveling. Great fun and variety for all ages. 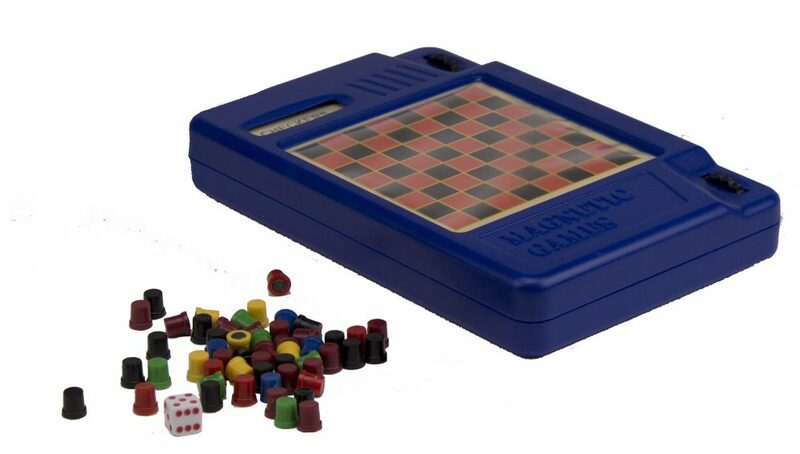 This set includes everything you need to play Checkers, Chess, Backgammon, Parcheesi, Chinese Checkers, and Snakes and Ladders. Stuff Happens (for 2 or more players, ages 13 to adult) – You’re going to read some really messed up stuff on these cards, and then rank them based on how bad they really are. Is a 3rd-degree sunburn better or worse than seeing your father naked? Is it worse than dropping your phone in the toilet? Rank the card, and if our Misery Index agrees with you, you get to keep it. Correctly rank 10 cards and you win. Available only at Walmart. Now that you have learned about some of the best games to take with you while traveling. 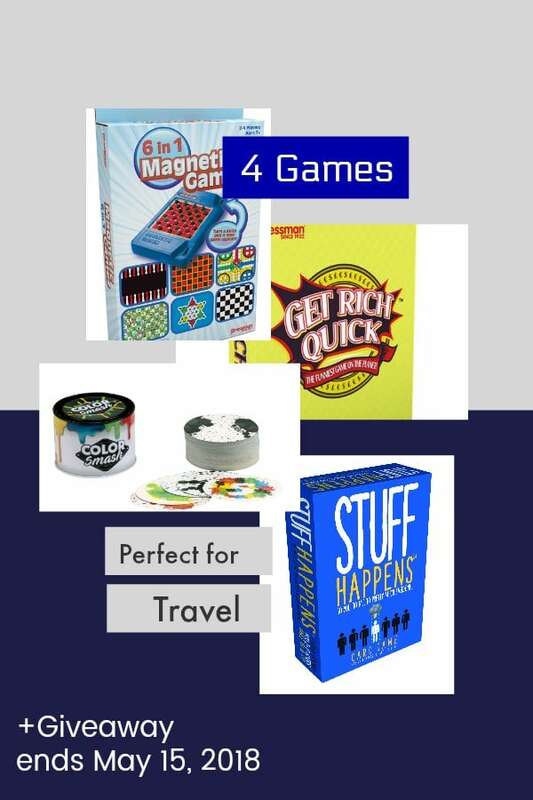 You are going to get the chance to enter to win these 4 travel games yourself. The USA only, please. Winner will have 48 hours from the time I email as the winner to get back to me otherwise I will be forced to pick a new winner. Remember to come back daily to grab your daily enteries and check to see if enteries changed since last time you visited. Entries are likely to change over the course of the giveaway. Now that you have learned all about the 4 travel games you are going to want and hopefully entered to win. 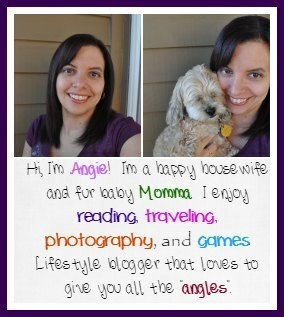 It’s now time to check out what great giveaways the other bloggers have up for grabs!